Pentax K-3. A very nice set of features. There is no actual anti-aliasing filter. Instead, there's a simulator that uses the same technology as the camera's image stabilization to shake the sensor during captures to produce the moire-reduction effect of an actual anti-aliasing filter. Effective at shutter speeds of under 1/1000 second, the image is subsequently fine-tuned to remove any artifacts. Turn it off for higher resolution shots. While the K-3 includes two SD card slots, one of them can be occupied permanently with an optional 16-GB FLU card designed to provide wireless control of the K-3. Using the card, settings like aperture, shutter speed and ISO can be changed and you can control the AF focus point and camera shutter release while viewing the Liveview image on a wireless device. The 27 autofocus sensors function between -3 EV to +18 EV with 25 cross sensors and three sensors dedicated to low light focusing. A new Real Time Scene Analysis System features an 86,000-pixel RGB light-metering sensor and improved algorithms to further enhance accuracy of exposure, white balance and autofocusing. One disappointment, to put it mildly, is the 1/180 second sync time. Pentax K-3 body only at $1,296.95 from Adorama or B&H. Pentax K-3 Silver Limited Edition at $1,596.95 from Adorama or B&H. 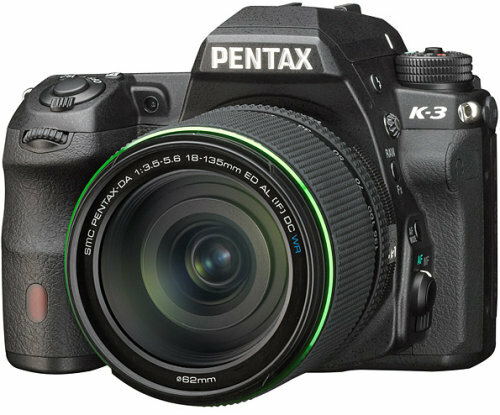 Pentax K-3 with DA 18-135 WR lens at $1,646.95 from Adorama or B&H.